Car not starting because of distributor hot wire. Hello. The car starts when I turn the key to iginition and when i remove my hand the car turns off. I used multimeter and the wire goes to the distributor is 11.5 volt when they key is on ON position. If I directly give the distributor hot wire from the battery it starts. What could be the problem? Sounds like an ignition switch problem. Try hooking up your volt meter to the coil positive terminal and read the voltage while cranking and when you release the key to the on position, there should be voltage at both positions. If not test the ignition circuit from the switch to the coil. When you are cranking over the motor, there is an output on the starter solenoid that sends full power to the ignition system and then when the key is put into the "RUN" position, this power out of the starter solenoid is turned off and then the ignition system is powered off of the ignition switch on the column. Since this ignition output on the ignition switch also powers up other things on the car, by doing some more observation of things one can narrow it down as to whether the problem is with the ignition switch or possibly a connection issue through something like the bulkhead connector. Since the "RUN" wire off of the ignition switch also powers other things if one were to turn the ignition switch to the "RUN" position and the TEMP and OIL were to come on then I would think the ignition switch is working so then I would be checking for power out of the bulkhead connector that goes to the ignition system. 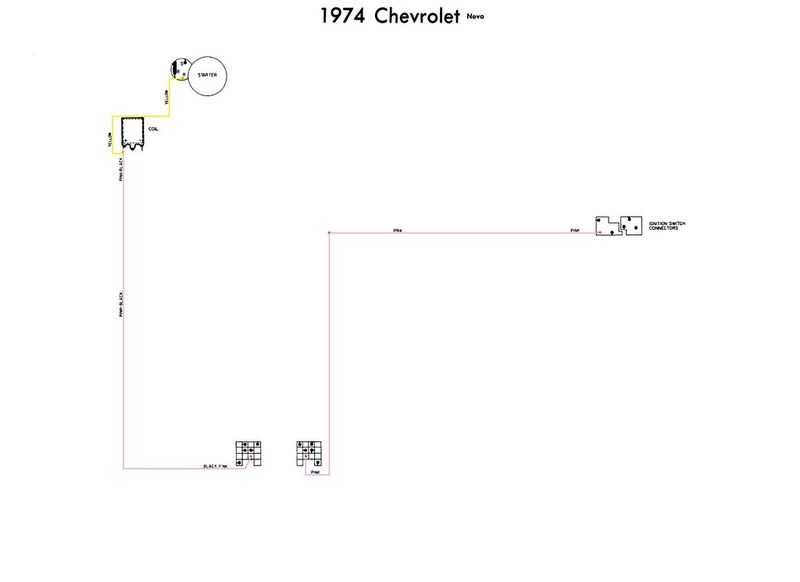 On this below diagram, there is a PINK wire off of the ignition switch that eventually goes to and through the bulkhead connector and out to the ignition coil but if you look at the diagram I failed to trace out how it branches out to the fuse block to then power other things up. 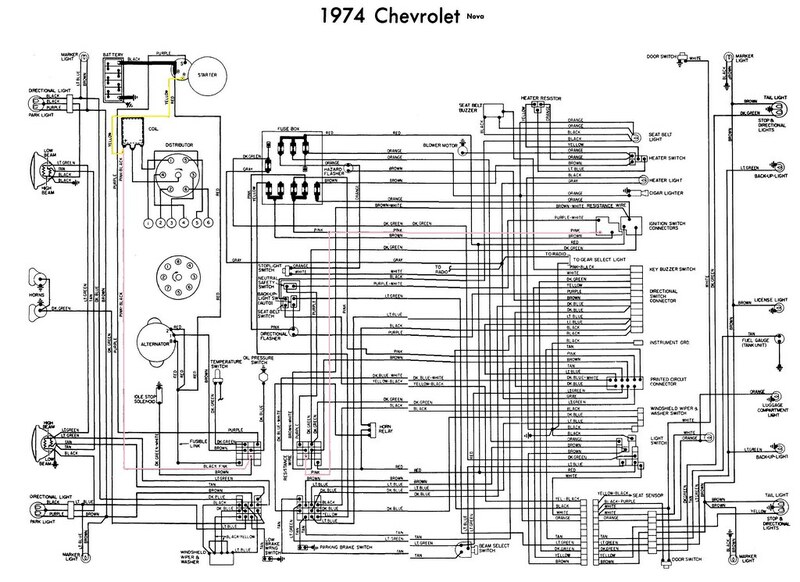 Also notice too on the diagram it calls out a carb idle solenoid that your car may or may not have and it also gets power from the same source off of the bulkhead connector. Oh god. It was so hard removing the bulkhead connector behind the break unit. Cleand it. Removed the fuse box and cleaned it. 2 days of work. Found that the wire between the bulkhead unit and the distributor is very bad and worn in a point almost not connected. I made a temporary connection. But I prefer to change the whole wire starting from the bulkhead connector. Today i changed the whole wire from the bulk head to the connection that goes to the starter and to the distributor. We dont have in syria the same male metal attachment in the bulkhead so i used it after opening it and replaced the wire. Thanks allot . I believe in this site even though my car is Apollo. Guys i have a question about the same topic. The worn wire i have changed is isolated originally with cloth. Like a more laier above the rubber isolation. I have never seen in the car a wire witha fabric isolation like the wire of home iron. The wire from the bulkhead on the engine side is a resistor wire. You may have noticed that is longer than needed to reach the coil. The voltage at the coil + should be about 9.3 volts with the key in the run position, this prolongs the life of the points. The wire from the starter solenoid to the coil provides full voltage while cranking, only when the starter is engaged. Ok I replaced it with a normal wire, I dont think we have resistor wires here in Syria, is it ok to keep it a normal wire or should I add some kind of resistor to lower the voltage? I'm assuming you have points in your distributor, if so they won't last as long. A breakerless unit would solve your problem.